It feels like the ship sails a century backwards into history, chucking modernity rapidly overboard. Daylight lasts from seven to seven and telebanking, electricity, clockworks, news, agendas and garb quickly become a sideshow. Staple food on this island are potatoes, onions and fish. Tomatoes keep a pre-war taste but are at 3 € a kilo barely affordable. That reminds us of those dozen fishermen who slept a hundred years ago in the net room that now is our theater costume room. The fishing nets served as their mattress and in the middle a huge cooking pot served them potatoes, onions and fish. Like many of the locals, they were often kids working for a grab penny. But the cheerfulness of the Cape Verdian poor is without doubt inversely proportional with the protestant rigidity that characterized the old-time crew who dreamed about the eternal Jerusalem without having a clue about what really matters. Besides sailing backwards, the ship sails southwards, towards other time zones in which the notion of the hours and dates fade away. It lures, to dismiss time. It’s quite a surprising novelty to find yourself waking up with the sun. As big a novelty as when you find yourself cleaning the guts of fish when you for thirty years persistently pretend NOT to fish dead fish but living souls instead. But what you do if poor fishermen throw fish flying on deck as a present? Anyhow, the strongest urge not to forsake modernity and electricity completely is the necessity to communicate with the world. Last millennium, a mere twenty years ago, I used to take a bar stool and a handful of coins to the nearest pay booth. It was the seasonal autumn work to try to reach a three dozen Italian, Spanish or French aldermen of culture about a summer show. You organised a tour by consequently phoning them with a wacky accent until getting to know their secretaries. Then you send them an old-fashioned letter deliberately with orthographic errors. The Fools Are Boarding Town. Now the situation is reversed. Now we rely on improvisation once arrived. But more then ever we need the connectivity to tell the story and share them with our fellow travelers all over the globe. We anchor the ship in front of the fish market. With the dinghy we first land on the crowded mole where the fishermen bring their night catch. That mole now is our navel cord with the town. Straight behind the fish market is a former police prison transformed into an artist area. 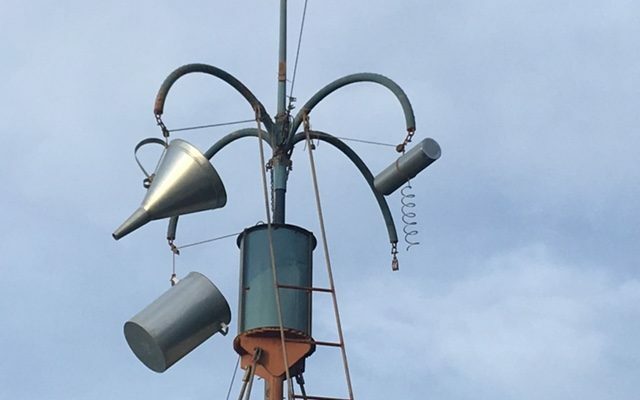 We speak there with a local theater group about sharing a theater festival around New Year and with a sculptor about restyling the Hieronymus Bosch tree in the foremast. Within a day we have the key of the prison and a rehearsal room. A story worth a documentary. Despite a luring Southern pace we cannot resist improvising a whole range of lofty assignments. The last one in this island will be to optimize the rigging and sails of the ship so as to ease the crossing of the ocean. Again, the five days of sailing look more like a Sunday afternoon cruise than a heroical braving of the Atlantic. Still, some nights, some sailors bind themselves with blankets to their matrasses not to be swept away. Many a glass doesn’t survive the moment of inadvertence of a novice steersmen. The garderobe, rapidly becoming redundant, swings with every wave as a mob of forgotten marionettes. A sea duck and even a bat land as stowaway. One morning we find a whole pan of flying fish scattered over the decks, even as high as the garden. Some made a direct hit to the kitchen already. They’re beautifully blue and delicately delicious and make the perfect Fish&Chip breakfast. A unique feature are the three sails hoisted permanently that gives a good mile an hour extra. After an interval of nearly ninety year, the ship sails again. With the archiviste Marja we select the best hundred-eleven pictures of the three decades of the itinerant theatre Azart. In memoriam of those hundreds of photo’s that never returned or never ever were made. Some art work sneaks in, some historical photo’s of the centenary ship and some pictures from the millenary imaginery of the Ship of Fools. Now, the reportage starts for real. Arrived at the Green Cape, we find an anchor place in between four shipwrecks and feel instantly at home. Without doubt, our ship is the oldest. Here we hunt for foolish actors. Music, or the voice, would be an excellent medium too, as they speak directly to the heart. Valle Gran Rey, Gomera, Canary Islands, Spain. The Fools finally arrive at their eternal summer. The pilot boat of San Sebastián harbour, on the Canarian island Gomera, gracefully escorts the ship to a deserted beach with pristine waters. Playa de la Guancha. The Guanche are the original aboriginals of the island. A perfect spot to start rehearsals that rock against a stunning scenery. The daily experiences are the subject of the new comedy. A foolish captain engaging a foolish crew for a foolish world trip. The show is a choreographed waiting for the food that the public brings in as entrance tickets but that never comes. A drunken sailor, haphazardly, chucks the pan into the water. Central stage is the long blue table on deck on which we rehearse daily our sunset evening meal. Slowly, rumours run around the island that the Fools have arrived. The first inhabitants approach ship with their pumpkins and bananas. A passing fisherman throws seven fat fish flying to deck. Some Yersey yachtsmen empty their fridges stuffed with calfsmeat, shrimps and merluza. Some of the crew sail the dinky daily into town for food and wine. When an occasional cruise monster moores, musicians from all over the island go busking. In those days, food abounds. The captain has only twice left ship for negocations with High Authories. That’s no easy bussiness. First, there’s hardly any place in these tiny harbours for a solid vessel like Azart. Then, they’re rather expensive. Then, local chiefs have no say over them. These ports are run by far-away organisations based in Madrid or Tenerife. But, most alarmingly, they require a burocracy that requires a lot of fantasy. Nothing is taken for granted: the arrival of fresh comedians, the permission for the shows, the reactions of the public, the moment to set sail six days southwards, nor tomorrow’s winds and waves. Nor tomorrow’s waves and winds. 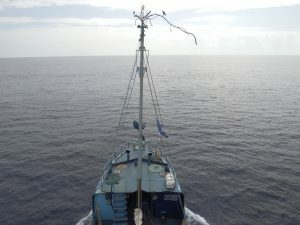 One night, we find ourselves drifting towards Mauritania, the anchor swinging a jolly thirty meters down into the depths. That invites us to let loose triple chain. After twelve days, our paradisical Guancha beach suddenly and collectively starts boring us, so we swop places to some bays ahead. A tiny village called Playa Santiago. 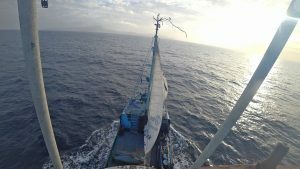 Next day already we swop places again, this time to protect the ship from the hot south-eastern, Saharian winds. We actually could make eternal magical tours around this island. On the western site of the island we find impressive cliffs and a meditation centre facing the anchor place. This town is called Valle Gran Rey, the Valley of the Big King, after the last of the Guanche kings. Here, the Fools have a – suspended – permission to present their new play. The Show Must Go On! At 3 hours from San Sebastián, Canary Islands, Spain. The world trip finally gets going. Departure again was postponed for about a week, for many a last minute ajustment, for meteorological reasons and for the petrol station running out of diesel, scandalously presuming Fools never would need or meet up for big quantities of diesel. For a whole weekend, while waiting at their station, the ship attracted large crowds of curious of all ages that familiarly and shamelessly settled themselves in front of the ship. And that cheerfully waved us good-bye when we escaped to a paradisiacal anchorage away in the bay. There, our ship writer and doodle-player joinly accomplished the miracle of an unexpected and delicate repair job by repatching the exploted cast iron exhaust manifold that alarmously went leaking again. The patch work of our dear master engineer lasted nine sailing days. The anchorage was in front of a ship yard of traditional wooden craft that invited us for an excursion to their wharf covered by journalists. And now six days sailing to the Canaries. Never ever been so well prepared. A unicum to give sailing instructions before sailing. Without cups or plates lingering in the steer hut nor any unwanted object occupying illegal places, without the content of so many drawers spread out over the floors, the travel looks more like a sunday afternoon trip then a dramatic good-bye to Europe. No leaking holes, no broken gaffs, gibs nor jibs nor torn sails – only to find in all the cabins, huts, saloons and rooms a very unfoolish neat and trim. Even an unprecedentent tidyness behind the cupboard’s shutters. The motor produces a stupyfing mantra and would be most delighted to run for another eleven thousend seamiles straight to Australia, or, for that matter, aonther seven years non stop – gazoil provided. The sails are put up for action, for mere exercise, arching for winds. Lake Atlantic. They new main sail, a present freshly given, exposes a huge blue Polish pharmaceutical publicity. “Lek Dla Serca”. A Medicine For Your Heart. South of Lisbon the sun starts hitting and the fruits and veggies running out. The DJ set including a host of classic CD’s moved to occupy the steer hut but badly misses our Amsterdam crew member and star DJ who played there some unruly nights crossing the Gulf of Biskaya. For the next steps the crew has the key. Already, it’s a great team providing fabulous facilities for guest artists. In the afternoon she meets on deck to devise a new show, promted by the spoon and fork of the ship’s figure head: “Here We Come – We’re Hungry”. It’s about a foolish captain stirring up a crew to great and good deeds. A comedy of slips and flops and fiasco’s around a desperate, central staged banquet. The food and drinks are provided by the public as a way of entrance ticket. All elements are on board, provided by a well stocked dressing room, a wide experience and age old fool’s traditions. An tremendous Atlantic full moon accompagnies us when crossing from Europe to Africa. On the port side the moon rises at dusk while the sun sets at starboard. At dawn the main actors swap roles. As time is precious, we concentrate on beauty and things that matter. We give a wide berth to tourist traps as Tenerife or Las Palmas and head straight to the tiny island Gomera where goat herds communicate in an age old whistling language. 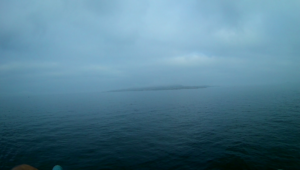 The island is in sight. We leave a confused continent behind. We’re your circumnavigating embassador, praising the carnivalesque traditions that put your perspectives upside down and that saved you from fundimentalism. Fellini told so: E La Nave Va ! Illa de Arousa, Galicia, Spain. 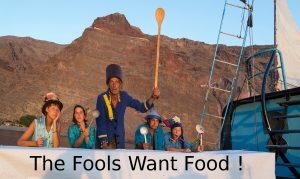 About a month ago the Fools arrived, exhausted, to this island and the locals required a relaunch of the fool’s spectacle as they remembered nineteen years earlier. Right they proved to be. A whole range of elements conspired to realize their claim in a superb way. First, a local clown called ‘Peter Punk’ saw the ship arriving and decided to mobilize his clown friends to collaborate with a festival. In the same way, a local gaita player, an old friend we met in the Basque country, decided to mobilize his crazy folk band to take part. Moreover, he and his Italian clarinista embarked for the next destination. A local fisherman borrowed his buoy to let the ship moor in the bay. The harbourmaster thought it wiser not to bother his superiors and magically gave his permission. Ramón the fisherman piloted the ship across the hidden and treacherous rocks. Ship and tribune were supremely located on the end of a jetty on the beach. The newspapers persistently published the proceedings, three days in row. They really did their best to invent incentive headlines. The Galician TV-News came along, eager to satisfy the curiousity of their audience. 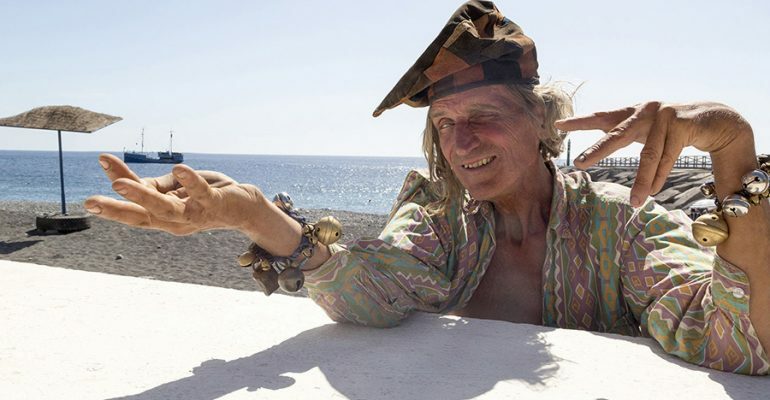 So last weekend, the first international Fool’s Festival took place. The programation was overwhelming, starting with a ‘Theatrical Visit‘ that brought kids and adults alike aboard – along six exciting cabins. Never before we’ve seen such a grateful public almost entirely connected with the fishing and the sea. First awaited them the ‘Pirate’s Cabin’ where the bandy-legged French sailor wisely stayed in bed receiving the public. The tour continued with a terrorific nymph in the ‘Princess Cabin’, followed by a foolish captain issuing foolish sailing licences in the ‘Steering Room’. Next a terrific granma scared the kids in our well stocked ‘Dresssing Room’. In the ‘Stowaway’s Cabin’ some pillows and the snorking from a mobil phone represented a sleeping, illegal refugee. The final stage was the ‘Artist Saloon’ with the ship orchestra playing local folk music while the cook prepared pinchos while explaining the ship’s history. All along the Amsterdam star singer Merante entertained the public from a fishing net hung up high in between the mast while holding a dutch clock from a ankling rod. ‘Pinchos’ is a favorite Spanish pastime that provides white wine with anchovies and other delicacies. So ‘Pinchos With The Fools‘ was the Festival’s Late Afternoon event that again seduced the locals, not so much with the poor quality pinchos but so much the more with the monologues, jokes and exhilarating melodies of the band. The highlight of the festival was “The Fool’s Gala”, the show itself, boldly reviewed in the newspaper as “A Risky Artistic Proposition That Mixes Comic Theatre and Circus”. Well, the local clowns Peter Punk, Coo and Pajarito performed first, perfectly knowing how to handle with their quirks their audiences. We Fools boldly restaged in three days our Amsterdam performance that surely dazzled our dear public by its unexpected windings. On Saturday a sensual Cape Verde woman percussion and singer band completed the festival, anticipating the Fool’s next destination. The last event was called, for not being published, “La Nada” (The Nothing), an illegal night club for the crew, the participating artists and their friends. Here, we introduced the most spectacular attraction to our night life that already in Amsterdam was famous for the ship wobbling and the floor wiggling. Here, with low tide, there’s only one meter of draft, so we put some more weigth to port side to have the ship leaning against the quay. But then, the merry-makers are dancing on starboard and one little dancing movement proved to be enough to topple the ship twenty degrees to starboard in one dramatic blow that tumbled a lot of glassware and nerves. The crew continues to be exhausted. In a few days she sets sail to the Canarian island Gomorrah, pretty confident to finally live up to our motto of ‘slowly hastening’. While writing this log book some nocturnal delphins encircle the ship. Faro de Vigo, Sept 21, 2017, frontpage. 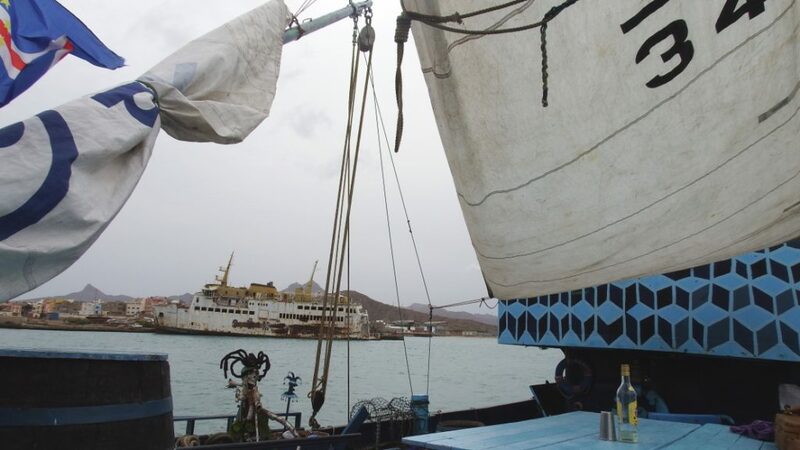 Moored in A Illa, the ship offers during the weekend a most various program together with local artists. A ship at anchor is a universe of sound and motion, gently rocked by the winds and waves. Time gradually loses sense, the days slowly overflow. Each morning the clouds greet us in a thousand shades of changing grey. The main wind is called the Portuguese North and remind us, rather cruely, of the ease of our destination southwards. To go with the flow ! But the crew hardly gets ashore. The fishermen and sunday sailors, as the ambassadors of the little island in the distance, are sailing by, frenetically waving and photographing. Some of them bring local wine, licuors or mussles. They think they live in paradise and they’re right, for some weeks. But the crew, one day, is involved in cleaning a thousand tools. Another day in sorting out a thousand ropes. Seven consecutive days in pumping and rowing a ton of bilge oil to the shore. The mechanic, who kept our motors running for nearly three decades, stayed a week aboard to make sure everything works. Over the decades this motor room slowly turned into a museum, loosing sense of time. The crew got enlarged with four women, defying maritime stereotypes. Ready for part two of the world trip: A Fool’s Festival on this island and sailing to the Canary Islands. Next weekend Fool House and Grand Voyage. The crew endured heroically the eigth day crossing of the Gulf of Biskaya that turned out to be a collective catharsis. Upon arrival in paradise the crew exploted. The skipper, a straight descendent of the great West-Frisian sailors that conquered the Orient, was send away for his recklessness. The Basque actress, purificated, decided to cycle backwards home along the pilgrimage route from the nearby Santiago de Compostella. The Amsterdam bar boy experienced a revealation and found his destiny, that, for the moment, leads to an alternative farm nearby. The French Buzuki player, as the Caribbean animation maker are leaving with a big smile. A few are left over, among which our French sailor who cannot walk far away with his broken and plastered leg. Instead, embarked has a local Galician gaïta player with his Italian girl friend who sings and plays the clarinett. They’ve been on board some years ago. 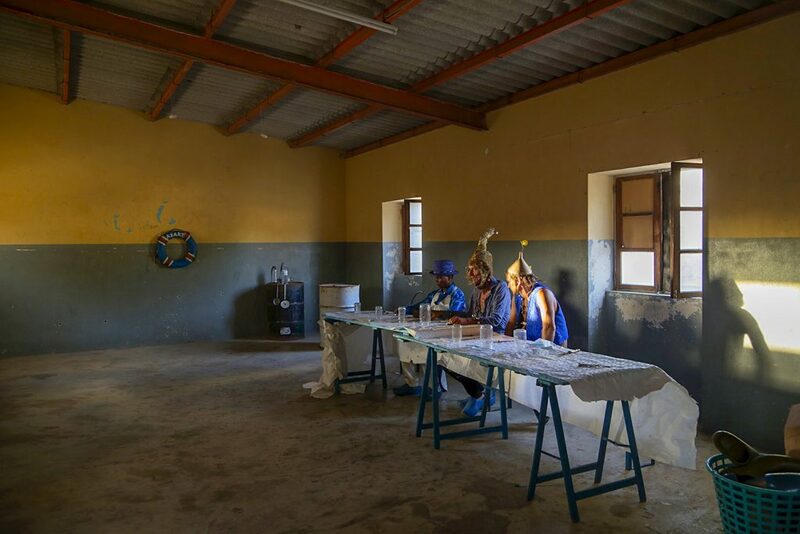 The gaïta is a Celtic bagpipe and the idea is to connect with a nearby artistic association of Cape Verde women to look for a musical cross-over. The shipload of our next trip. And paradise it is. This bay is presumably much more beatiful than the Canarian Islands that are infested with the big muddle of ugly and expensive white plastic yachts. In the middle of this bay is a fishermen’s island whose inhabitants have a reputation to be fools. 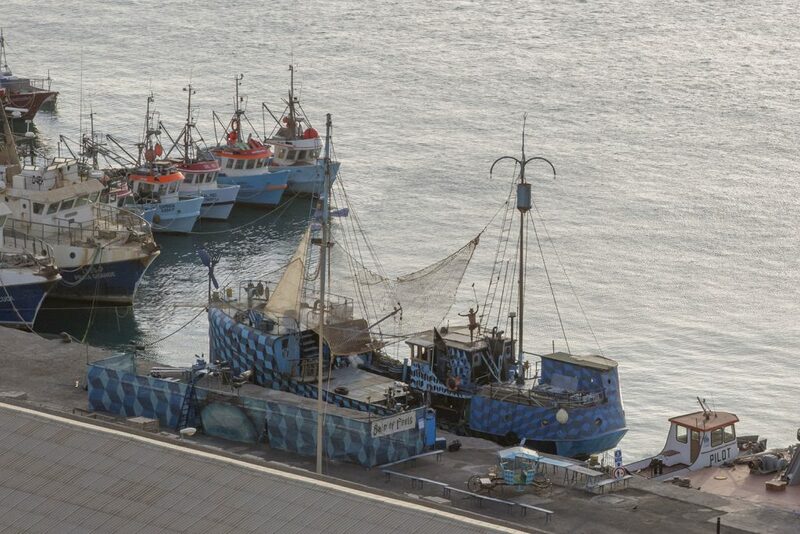 We have to implore the fishers that sail past not to bring more mussles. A few hours after mooring arrived at our achor place the jounalist who’s first assignement in his career was the Ship of Fools. That was 1999 and again he repeated as the fool’s court photographer during our stopover in 2012. Now he created with an article the big fuzz around a festival the public demands us to organize. This festival is going to be a collaboration with a local association of artists headed by the daugther of the ship yard’s owner. It’s impossible to show up on the street or in a bar without being spoken to or interrogated about the upcoming festival. One shows from his wallet a crumpy 1999 black-and-white photograph of the ship. Another one says to shorten his holiday to be there for the spectacle. A woman was indignated to have had to pay for her 1999 entrance while a fat man in front of her went in for free. It seems as if we have come back especially to explain to her that those weighing more than 111 kilo have all the rights to enter for free. It seems our return awakens a collective frenzy about a romantic vision of their own yought, when everybody was twenty years younger. We returned – by chance – to feed more illusions. Yesterday, a family of four delphins were circling around our ship. Ilja de Arousa, Galicia, Spain. For five years the Fools were engaged in making theatre and cabaret in the Basque country and later in Amsterdam. Now, to hop the continents, attention quickly shifts to the ship, the old lady herself who badly needs more attention than the blue diamond facelift she received last year in the ship yard. Sailing over the Atlantic showed a whole range of shortcomings. For most of the crew a strong breeze already is a storm.. And with no more than a strong breeze booms and gaffs broke or bended and the gib dissapeared altogheter. All three safety rafts went hobbling, one of them prematurily into the sea. In three different places the incoming water had to be pumped out. On a certain moment none of the four generators were in running order, risking to turn the ship in nigth time into a kind of flying dutchman. On those moments, at least, Big Brother is not watching us on our Automatic Identification System. Dissapeared from the radar. The motor room, that we try to keep clean and clear, amassed an incredible multitud of sticky oily objects and instruments that started to slide to and fro. My skin got greased in a mix of sea salt, arnica and motor oil. And we kept changing destinations. We changed the Canarian islands to Madeira to make it possible for our star singer Merante to attend a well paid gig. I was tempted to interrupted already the travel in the North of Bretagne, knowing there’s a ship yard run as a social project by volunteers. And just when the favorable Portuguese North winds promised to bring the ship smoothly to Madeira, I thougth it better to cancel further chaos and improvision and to concentrate on some basic technical conditions we better comply. That could take two weeks or two months. One of the jobs is to patch the roof of the fourteen tonn water bunker that flooded the dressing room and turned the drinking water every day more colourful. So this morning, the Fools entered the bay in such a thick mist that there was no distinction between the sea and the sky. We moored on a floating dock of a tiny fisherman’s harbour of a scenic island in the Ría de Arousa, in Galicia. Even the achor manoevre failed. We visited the island already in the last milenium and again five years ago. Being old friends, the environement of the Ría is propitious. Plenty of mussels. We know there’re some gaita players around who could be most helpful to realise a music project in the Cape Verde. On the way hussling the Canarians. 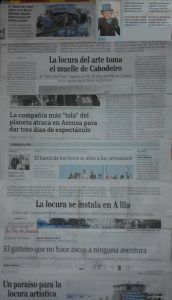 Last time the heading of the local newspaper in the Ría described the project as “A Single Ship’s Journey to Lucidity”. Una Singladura hacía la Lucidez. We might make turns but we get further.